On the 1st April 2017, companies with high energy consumption will be required to use smart metering that provides a half-hourly measurement. Who is affected by P272 meter changes? At the moment P272 affects the commercial energy market. It is a regulation that has been introduced by Ofgem as a mandatory change for high usage commercial energy customers with electricity meters in profile class 05-08. How do I know if my energy meter is profile class 05-08? In green is the number that can identify whether upgrading your commercial energy meter is necessary for your business. This is your profile class. If this number is 05, 06, 07 or 08, you need to take action regarding P272 meter changes to avoid missing out. How do I know if I need to upgrade my electricity meter? If you are still having trouble finding your number or have any questions regarding how these changes will affect your commercial energy supply, please don’t hesitate to get in touch with a member of our friendly team on 0800 9777 000. Alternatively, you can learn more about P272 meter changes here. We can advise you on the best course of action and answer any questions that you have. You can also arrange for a member of the team to get in touch with you by entering a few details into the call back form below. Upgrading commercial energy meters to comply with P272 meter changes isn’t the only change that is occurring within the utilities market this year. 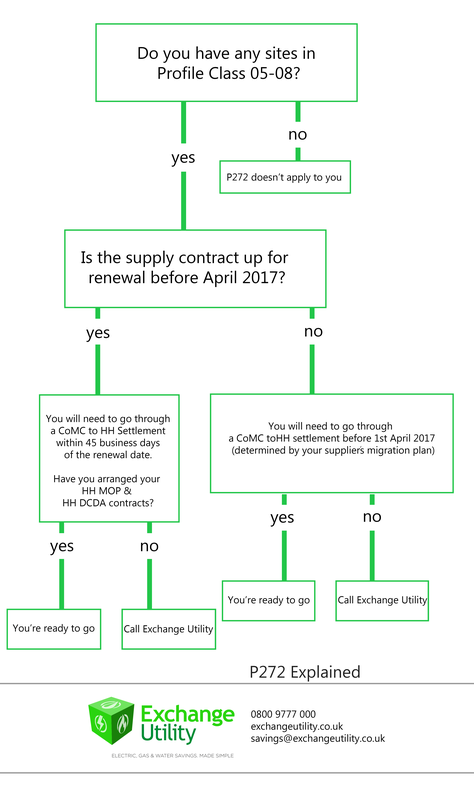 DCP 228 is another regulatory change that affects the way that your electricity distribution charges are calculated. Distribution charges usually account for about 19% of a consumer’s bill, therefore these changes have the capability to create some rather drastic differences in billing. The open water market has been available to businesses in Scotland since 2008 and has already proven to give businesses fantastic new opportunities to save money on overheads. The Scottish Government itself has already taken advantage of this, which has resulted in £40,000,000 worth of savings becoming available to them over the next four years!